We all know that Superman is this all round action hero, basically a good guy who works as a reporter by day, but is the savior of earth many times over from external threats as well as internal ones. Well, here is not a good way to pay homage to him, but it is fun – with the $6.99 Superman Crazy Foam. 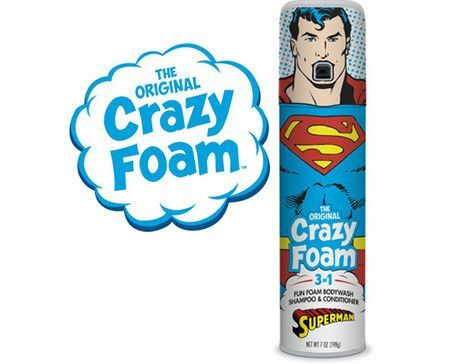 Having first hit the stores in 1965 before disappearing in the early 90’s, it is nice to know that the Superman Crazy Foam is back for more action. It is better and larger than before, where Superman will shoot foam out of his mouth – making it far easier to coax your muddied children to take a bath. This new formula is a fun foamy body wash, shampoo and conditioner that can be dispensed with an easy-to-access spray button.